Named for Iowa’s distinct glacier-formed hills, Loessfest is a week-long festival that runs this year May 23—31. The festivities will be going on all week at the Tom Hanafan River’s Edge Park on the Missouri River outside Council Bluffs. Sunday night, conductor Thomas Wilkins led the Omaha Symphony in a concert honoring veterans. After the concert, there was a choreographed fireworks display over the lawn. All Monday was Picnic in the Park, a day to explore the Great Lawn of Tom Hanafan River’s Edge Park. After dark, the park lit up courtesy of Dan Corson’s interactive light show “Rays.” This light show is part of the Iowa West Public Art collection and came to life every half hour after sunset. For 50 years, the Second City improv comedy group has been bringing laughs all over North America. This Tuesday, they bring their routine to Council Bluffs. Look for them at 7 pm in the park and remember, these laughs are free. Once the sun goes down, the big screen goes up. It has been 40 years since the great white shark Jaws first debuted and since then the film has become a classic. Starting at 9 pm, come see the horror blockbuster Jaws showing for free in the park. Thursday night features an all-ages celebration of the world-famous band Journey with Recaptured, one of the best Journey tributes in the world. Come out and hear some of your favorites: “Don’t Stop Believin’,” “Faithfully,” “Any Way You Want It,” “Open Arms,” and “Wheel in the Sky.” The free music starts at 7 pm. Disney Day starts off with a visit from Darth Vader at 5pm and a chance to win tickets to “Star Wars: Episode VII – The Force Awakens.” At 7 pm, the Imagination Movers will be holding a free show for all the kids. Right after that, don’t miss a showing of Disney’s Big Hero 6 at 9 pm. Looking for a gorgeous way to spend your Saturday? Starting at 10 am, there will be a free bike tour of the Tom Hanafan River’s Edge Park and the city of Council Bluffs. This path loops 27 miles around the city and landscape. Can’t wait for MAHA in August? Loessfest has partnered with MAHA to bring you Mini Maha, featuring Ben Kweller, The Dodos, and Lincoln’s own Oketo. This free concert begins at 7 pm. All day long, come play 27 holes at the Dodge Riverside and Westwood Golf Courses or watch for free. Golfers interested in playing can call 712-328-4660 for registration information. Registration includes lunch and a steak dinner. 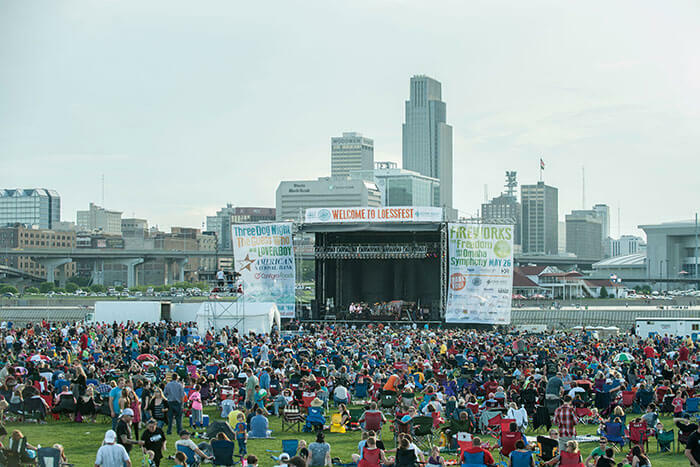 Loessfest is also partnered with Taste of Omaha, which will be happening this Friday, Saturday, and Sunday. More information about Loessfest can be found at their website. Stay tuned on their facebook or twitter for updates and potential weather cancellations.